When a child is diagnosed with cancer, an entire family and community is affected. Create a treasured network of support for these courageous children by showing your commitment in finding a cure. Wear our Walk for Childhood Cancer Awareness Shirt at your next awareness walk event to proudly show who you are walking for with love and compassion. Our Walk for Childhood Cancer Awareness Shirt is a great way to support the fight for a cure. This Personalized Childhood Cancer Awareness shirt is available on our 100% cotton preshrunk long sleeve shirt, machine washable in youth sizes S-L and adult sizes S-2XL. FREE Personalization is included on the back of each Shirt. Personalize the back of your Childhood Cancer Walk Shirts with any three line custom message. Too many families have been touched by cancer and its consequences, and we must work together to control, and ultimately defeat, this destructive disease. Showcase your commitment to spreading the word about the importance of research and treatment through our collection of Childhood Cancer Awareness Apparel and Walk Gear. For each item purchased, MyWalkGear.com will donate a portion of the proceeds to a charity of your choice. 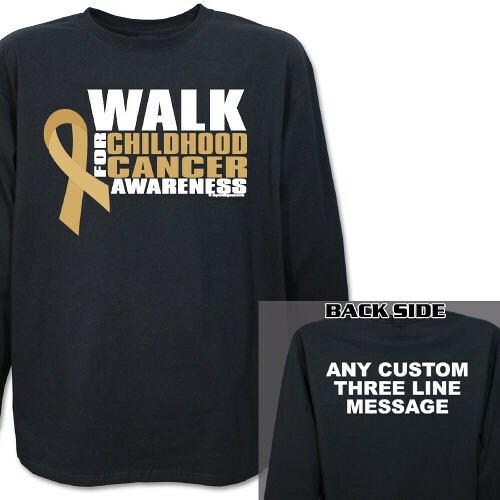 Be sure to also view our Walk to Defeat Childhood Cancer Awareness T-shirt and our Walk for Childhood Cancer Sweatshirt for any upcoming walk event you may be joining.